This is a very long overdued review, and I feel bad for always procrastinating and putting it off, but now that my eczema is back to haunt me, I am reminded of this soap I used several months ago. I brought this bar of soap back from the States last year, and it was sitting on the rack in my bathroom, untouched.Â Okay, I have to admit that I sort of forgot all about it.Â Then my skin started to feel itchy and dry using the regular soaps and body shampoos I used to use back in Malaysia.Â I don’t know why, but perhaps my skin was just overly sensitive.Â On top of that, eczema came back to visit my fingers! I knew I had to do something, and THEN I suddenly remembered that bar of Skin Free Extra Moisturing Soap.Â My first impression of it was that it lathers really well, and I love that it was totally unscented!Â After a few days of using it, my eczema miraculously healed, and my skin was less itchy. I later found out that this soap had been awarded the National Eczema Association Seal of Acceptance August, 2008.Â That certainly says something, huh? Prolong the Life of Your Soap: Be sure to remove it from the shower area and allow to thoroughly dry after use. The soap lasted quite a while too, and I was honestly sorry when it ran out.Â This soap retails for just USD3.99 for a 3.5oz bar but it is only available in the United States.Â For other great Skin Free products, do check out the Skin Free website. 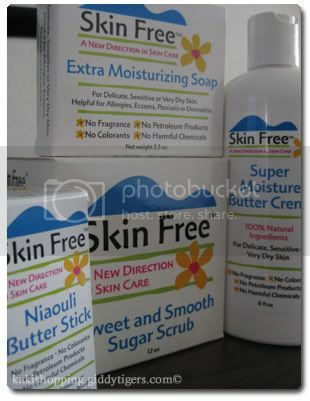 A while ago, I reviewed 2 products from Skin Free.Â Bottom line:Â I liked them a lot!Â I recently finished using my bottle of Super Moisture Butter Creme though, and will be reviewing the soap and scrub really soon. If you love Skin Free skincareÂ products, and if you are a person that loves being environmentally- friendly, OR if you are Eco-Chic (love that term! ), then you have got to check out the Eco-Chic contest organized by Greenwala and Skin Free Skincare. Enter for a chance to win a year’s supply of Skin Free skincareÂ products!Â The contest ends December 31 2009, so you’ve still got plenty of time! A couple of weeks ago, I received a very nice package of products from Skin Free skincare.Â This is a company that specializes in products targeted at individuals with extremely sensitive skin.Â As a long-term sufferer of eczema, I was excited to give these products a go, and specifically requested for the products that would help me with healing my eczema totally.